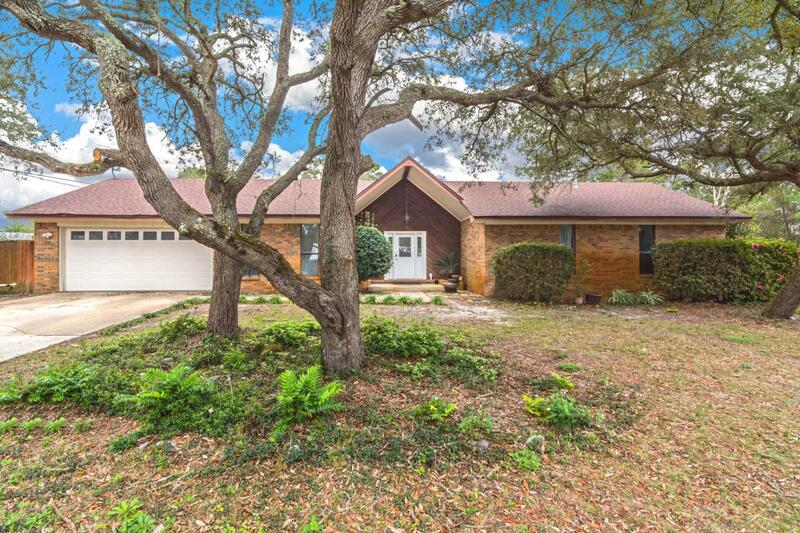 Great location - just 3 miles from Hulburt Field! As soon as you enter this charming all brick home, you will fall in love with the floor to ceiling brick wall fireplace and the high cathedral ceiling in the spacious living area. Follow the wood tile flooring to the beautifully updated kitchen that features granite counter tops, soft close wood cabinets, stainless steel appliances, and an island breakfast bar. Eat-in kitchen, formal dining room, and a separate laundry room also adds to the spaciousness of this home. The large master bedroom features an upgraded bathroom featuring a beautifully tiled walk-in shower and granite-topped vanity. All this situated on a larger lot with mature trees and no side neighbors!Sit back and relax in your screened-in porch or warm up on cold nights at the outdoor fire pit in your backyard! Adorable pergola in place with plenty of room to add your own pool. This home has been freshly painted and has been very well maintained! Ask your Realtor about the secret room located inside the home! Just a short drive to the beautiful Emerald Coast beaches in Fort Walton, Destin or Navarre!